LCD Display Screen Cleaner helps you safely clean your valuable electronics anytime so you can always enjoy the best possible picture quality. 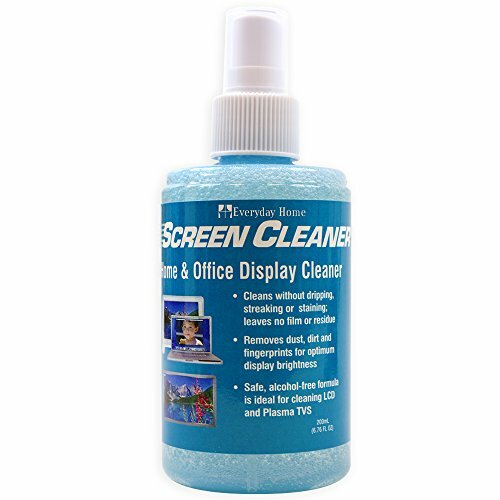 Works great with flat screen TVs, regular TVs, cameras, laptops, projection TVs, portable DVD players and other electronics.The LCD Display Screen Cleaner alcohol-free, ammonia-free solution and special cloth gently polishes your electronic displays without scratching or damaging them. Unlike ordinary glass-cleaners, the Display Screen Cleaner resists dripping into delicate electronics. Plus, the Display Screen Cleaner solution is specially formulated to reduce the static electricity that attracts dust.With the LCD Screen Cleaner, you get one large bottle of Screen Cleaner solution and a special microfiber cleaning cloth, so all your electronic displays can stay free of dust, fingerprints and streaks. Get all the performance you paid for from your home theater and multimedia equipment. If you have any questions about this product by Trademark Home, contact us by completing and submitting the form below. If you are looking for a specif part number, please include it with your message.